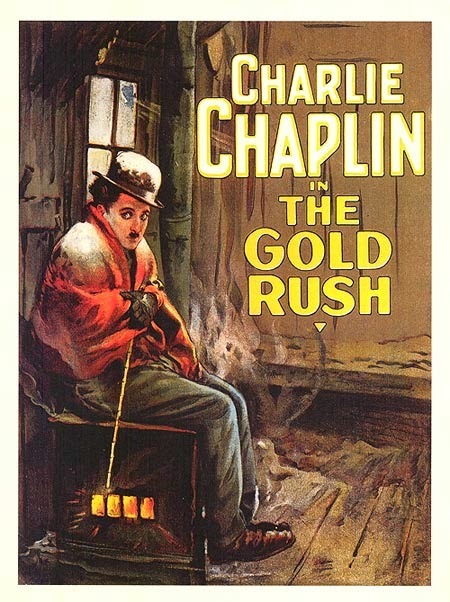 The Gold Rush is a film I tried to watch previously, but I could only get my hands on the 1942 re-issue with Chaplin's mood-ruining narration in the background (don't bother with this version of the film, it's not worth it). I recently managed to acquire a copy of the Criterion restoration of the original, which looks remarkably good considering they put a disclaimer at the beginning saying the various sources they had to piece together vary "drastically" (they don't). When the film begins, it looks like a Werner Herzog movie (some of the framing is actually quite reminiscent of Aguirre: The Wrath of God). Tiny men struggle against the immense forces of nature. Blinding snow and sheer mountain faces. There's even a grizzly bear. This sober setup provides the perfect contrast for the rest of the movie. It pretends to be a serious historical docu-drama right up until the moment the Tramp wanders into the frame and narrowly avoids being eaten alive. I love Charlie Chaplin more than I can adequately express. Something about his signature brand of slapstick in everything from The Kid onward (maybe even starting with A Dog's Life) just makes me warm inside. I rarely laugh out loud at movies particularly when I watch them alone, but Chaplin always knows right where my funny bone is. The problem for me is that, with the exception of some of his later work, my analytical mindset doesn't really work on his films. I could talk about what I see as the typical Chaplin tropes (money, love, law, and alcohol), or ramble on about how he uses fantasy to make his characters lovable (showing us their desires before taking them away); but these aren't what makes Chaplin one of cinema's all-time greats. What makes him great is something more subtle which I can never quite put my finger on. His physical performances are second to none. He conveys character through the way he moves. And here in The Gold Rush, he has some of his most memorable moments. I mean, just watch the way he dances on the dinner table with a pair of rolls.